Semmelweis University in Hungary hosted the Eurolife Spring Meeting and Eurolife Spring Symposium 2018. The Consortium gathered in Budapest on 14-15 May 2018 to review and evaluate the activities of the Network, as well as to discuss potential new initatives and developments. The meeting initiated the new three-year coordination of Eurolife Network, now to be performed by the long-standing member of the Network, University Medical Center Göttingen. 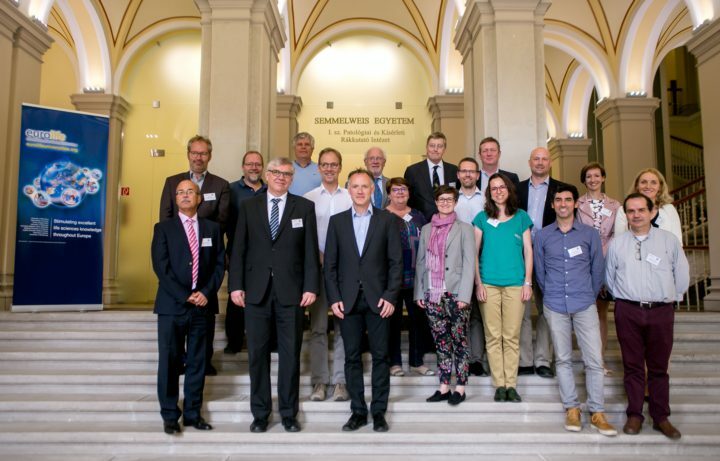 The meeting concluded with the Eurolife Symposium, which welcomed presentations from renowned academics from Semmelweis University, offered cutting-edge lectures in oncohematalogy, heart and vascular studies, physiology, epigenetics and genetics, cell- and immunobiology. The draw of the Symposium was the Eurolife Distinguished Lecture of Prof. Pancras Hogendorn titled Understanding Cartilaginous Tumours. Prof. Hogendorn was awarded the Eurolife Distinguished Lecture Medal as an act of appreciation of his achievements and contributions in science, as well as gratitude for extended involvement in Eurolife.